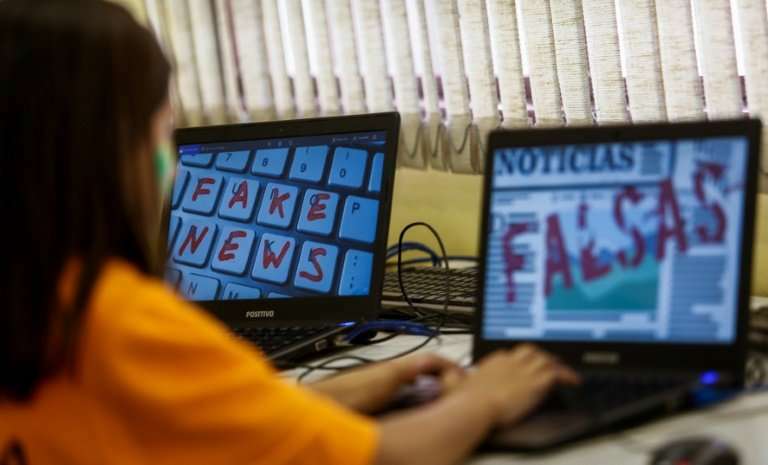 Brazil has taken a stand against the explosion of "fake news" stories swamping the internet by making media analysis studies compulsory for schoolchildren. Around the world, debates proliferate about the problem of unfettered information flooding social media, uploaded by people with no consideration for journalist ethics, impartiality or even the truth. Of particular concern is the effect such misinformation can have on those most impressionable. "The aim is to teach students to identify fake news, and now it's part of the national curriculum because the country has decided it's necessary," said Leandro Beguoci, editorial director at Brazilian education specialists Nova Escola. "The proliferation of social media networks have created an urgent situation in this respect," Beguoci said. Media analysis studies became compulsory in December 2017, but have been offered alongside traditional subjects like mathematics and history for years in some Brazilian schools. Kayo Rodrigues, 14, said the Brazilian press is not perfect, but plays a vital role in combating fake news "because not everyone has the internet or the tools to check facts." She enrolled in the "Young Press" program launched six years ago in the Casa Blanca public school in Sao Paulo. At Casa Blanca, teachers Lucilene Varandas and Hildenor Gomes do Santos ensure their students, aged eight to 14, know not to take everything they watch or read at face value. "When I receive a piece of information, I look for it on the internet and ask myself if it's true," said Helena Vital, 11, whose parents are teachers. She said the program has taught her to view the media from a different perspective. "Now I know that things aren't so bad, the whole country isn't going to collapse," added Vital, who said that consuming news without questioning it "leaves people sad" and that "there are many negative things that aren't true." The children do not have the tools to systematically check everything, but "they look at the articles, who wrote them, who could be interested in them and where they're published, which are all ways of questioning the information," said Varandas, who is looking to create partnerships with fact-checking agencies to expand the children's education. The measures seem to be working despite the children's young age. "All it takes is one click to share false news; this project teaches me to think about my clicks," said Rodrigues, daughter of a shopkeeper and a manicurist. The students enrolled in "Young Press" have also been analyzing local media stories about the project, and even found inaccuracies. AFP was told its own coverage would be equally scrutinized. With a population of almost 208 million people, Brazil has a massive social media presence: 120 million WhatsApp users, more than 100 million people on Facebook and another 50 million signed up to Instagram. "In the past, kids were taught by their parents, but now that happens through a variety of means, something which alters the role of the school," said Beguoci, a trained journalist. "What's so interesting in Brazil is that media and technological literacy are considered as important as classical literacy." Beguoci denies that information analysis is an additional burden on the education system, saying it rather offers "a context that can improve education." "We're talking about things that are part of the student's world," he said. For Veronica Martins Cannata, who coordinates technology and communication studies at the private Dante Alighieri school, children have their own responsibility when it comes to fake news. "Technology has facilitated communication, but the time has come to question its content," she said. "As natives of the digital age, children and teenagers must take the responsibility to analyze that content before reproducing it." Dante Alighieri has been analyzing media content for 11 years and has also brought the fight against fake news into the classroom. Children are born "with ingenuity," but at school they acquire "a critical eye and no longer consume information in the same way," said Martins Cannata. Such media analysis studies will not necessarily create a new generation of wannabe reporters, though. Vital, for one, is suspicious about the press that "is sometimes flawed in its credibility." Asked if she would like to one day become a journalist, Vital said: "I prefer swimming!"